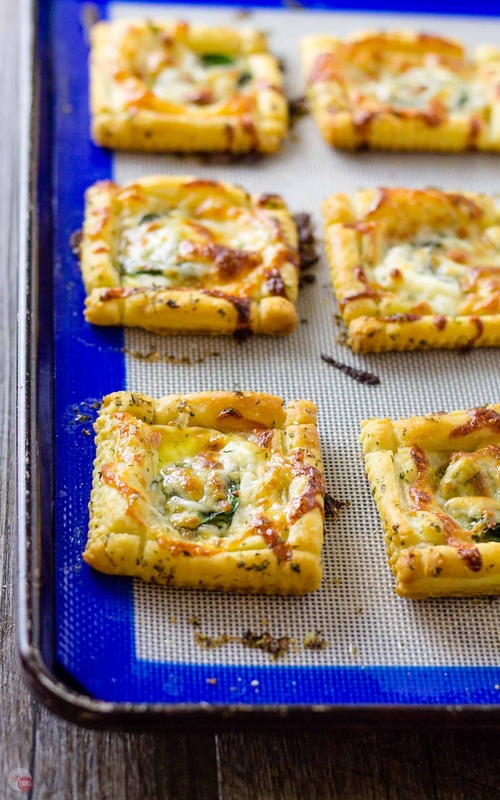 Home » White Pizza Mini Tarts – No Messing with Regular Dough! White Pizza Mini Tarts – No Messing with Regular Dough! Against red sauce? I bet you like White Pizza then. Check out my single serve versions of those no-red slices with my White Pizza Mini Tarts! For all my pizza lovers out there, these White Pizza Mini Tarts are for you! What is a white pizza you say? Those of you who are in a love-hate relationship with red sauce this recipe is for you! While we are leaving out the red, or classic marinara or pizza sauce, we are also forgetting all the fuss with making pizza dough from scratch. I would not be following the food blogger’s code of saying that homemade, and from scratch, are best, but fussing with yeast to make pizza dough is a pain. I usually buy mine in a can (GASP) or fresh from the bakery of my grocer in one pound packages. But this recipe forgoes all that mess and uses Puff Pastry. I love Puff Pastry!!! The puff pastry bakes up a nice golden brown and crispy enough to feel like traditional pizza crust. But the crust is not all that is great about pizza. Be it a Neapolitan, Deep Dish, or Hand-Tossed the crust is important but not as important as the toppings. Much like a salad, the best parts are the toppings. Let’s talk about toppings for a White Pizza since we know it doesn’t contain red sauce. Hence, the name. Most white pizza, or Pizza Bianca, that I have tried are topped with a garlic oil instead of red sauce, a healthy dose of cheese (Ricotta and Mozzarella,) and occasionally spinach. 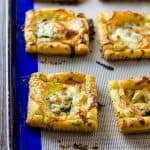 Most purists believe that spinach should not be included because that would make it green pizza, so the fresh spinach leaves on the White Pizza Mini Tarts is optional, of course. The flavor of the White Pizza comes from the garlic oil that is put on the dough before the cheese (and spinach) to give the dough its flavor. So I upped the flavor factor with garlic sauce that is reminiscent of the garlic mix for my mom’s Garlic Knots. Olive oil, TONS of crushed garlic, some Italian Seasoning (or just oregano and basil,) and a little heat with crushed red pepper flakes. Puff pastry has a ton of butter in it already but brushing the crust with the garlic sauce keeps the center of the tart from becoming soggy. The fresh spinach and ricotta cheese have high amounts of water so you need to protect your pastry if you want a crispy crust. 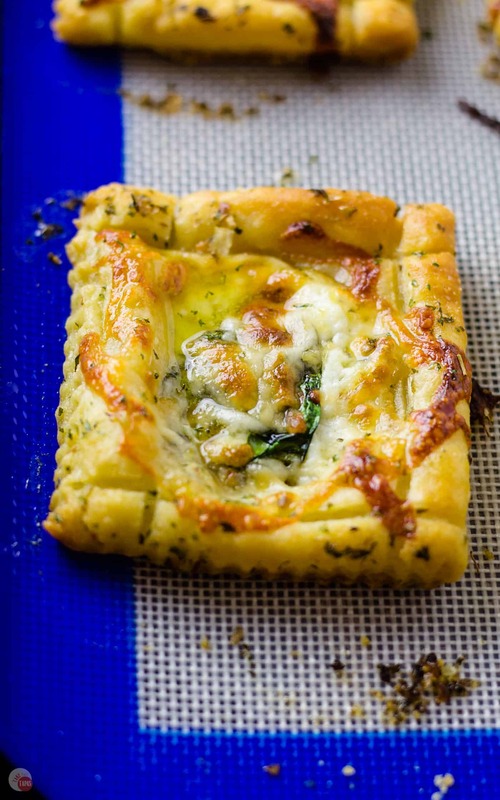 Top the garlic sauce with a bit of ricotta, mozzarella, and a few fresh spinach leaves and you have a White Pizza Mini Tart that will blow your mind! Bake in the oven on a cookie sheet lined with parchment paper or silicone baking liner for just 15 minutes. The parchment paper/silicone liner keep the tarts from sticking to the pan and you can slide them off onto a serving tray to be gobbled up. If you really have to have some red sauce or are serving these at a party where the guests are arguing over which pizza is better, have a small bowl of red sauce on the side for dipping! And then everyone is happy. I am totally hooked on these White Pizza Mini Tarts and they are a great way to celebrate National Pizza Month. How are you going to celebrate? Combine the olive oil, minced garlic, Parmesan cheese, oregano, parsley, and red pepper flakes. Open the puff pastry and unfold both sheets. Cut each sheet into 9 pieces along the fold lines. 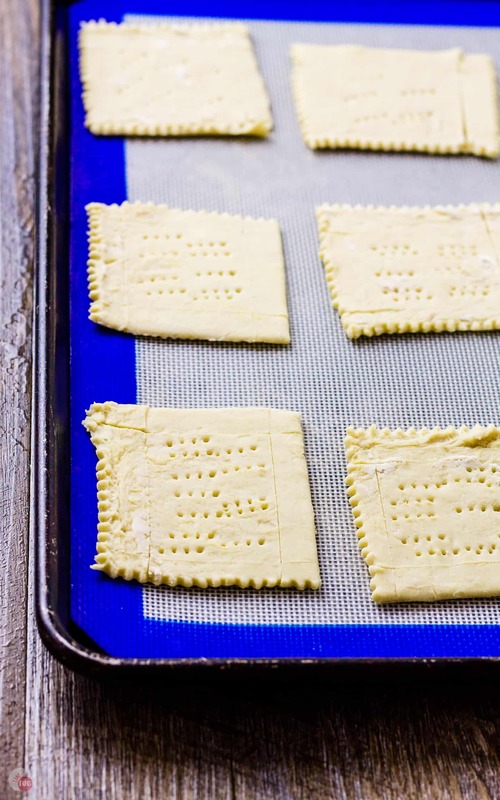 With a sharp knife, score the puff pastry squares along each side, 1/4 inch from the edges. Place the 18 squares on two baking sheets lined with parchment paper or a silicone baking mat. Fork the inside square to “dock” the center and keep it from puffing up during cooking. 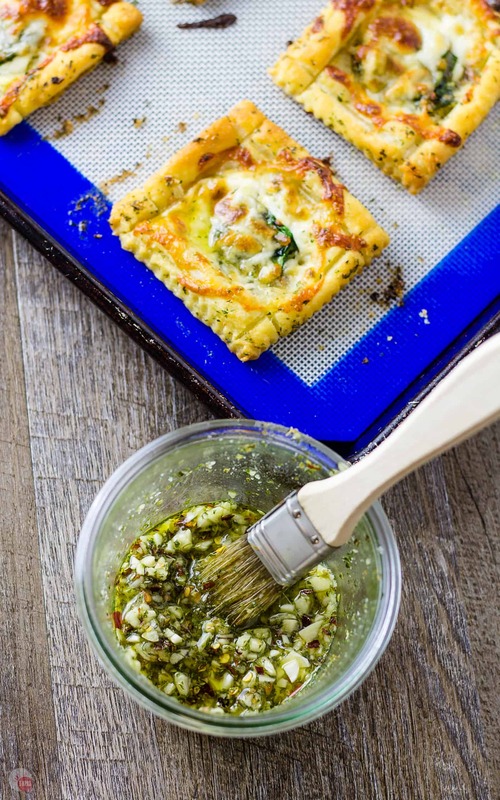 With a pastry brush, brush the whole puff pastry square with the garlic sauce. Add 1 teaspoon of the Garlic Sauce to the center of the puff pastry. 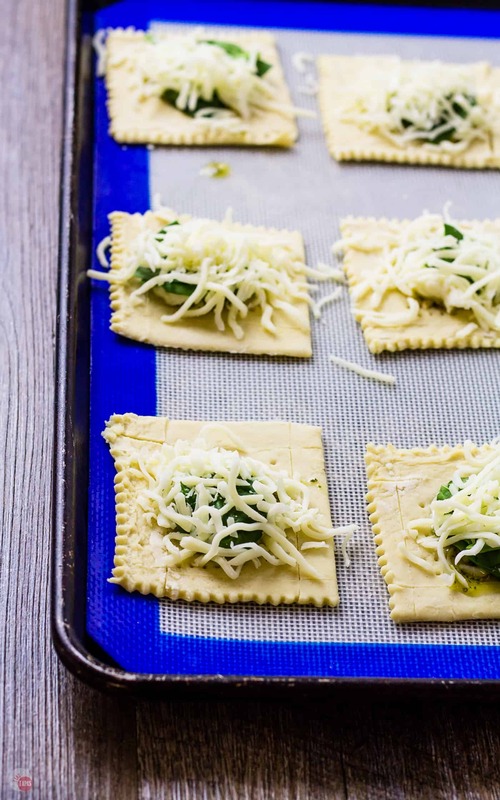 Top each square with 1/2 teaspoon of ricotta cheese. Add two fresh spinach leaves, torn in half to fit the inside of the tarts. Top with 1 tablespoon of mozzarella cheese. Bake at 400F for 15 minutes or until golden brown along the edges. Place the White Pizza Mini Tarts on a serving tray. *If you don’t have oregano and parsley feel free to use Italian Seasoning. We are celebrating National Pizza Month with a few new pizza recipes! Check out these other pizza recipes from my blogging friends that will have you enjoying pizza in a new way! Wow, those minni pizzas are really lovely <3 Thank you for sharing this recipe. Even though I'm on a diet now, I will make sure to prepare them. Small pizzas won't do much harm 😛 Though, they are rather healthy so that shouldn't be a problem! This is such an awesome spin on a classic pizza! I want some! the puff pastry crust is such a great idea! I didn’t know it was pizza month but I’ve been celebrating it without even knowing about it. I love these mini pizzas and especially the white version. They look absolutely delicious. I’m not against red sauce but believe in spreading the love…pizza love! Oh my word!! I feel like I gain 10 pounds every time I visit your blog!! 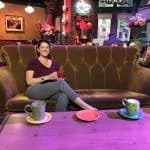 Your food is just out of this world! Calories eaten with friends don’t count! Wowza these look and sound INCREDIBLE my friend!!! What a great easy and flavor packed recipe! Making these VERY soon!! These look amazing! They would be so fun to serve at a party! These look delicious! I would eat so many while watching the game. I love the garlic & cheese on the too. Pizza is something that I consider to be the perfect food and with this recipe I think you may just have created the perfect appetizer; I could eat the entire batch of these babies! I’m getting hungry just looking at these! Serious yum! I would probably eat the whole tray of these! Love it – this looks amazing! These are darling! I can’t wait to try them! These look amazing, and those flavors!—–YUM! I will take mine with the spinach please. They look lovely.